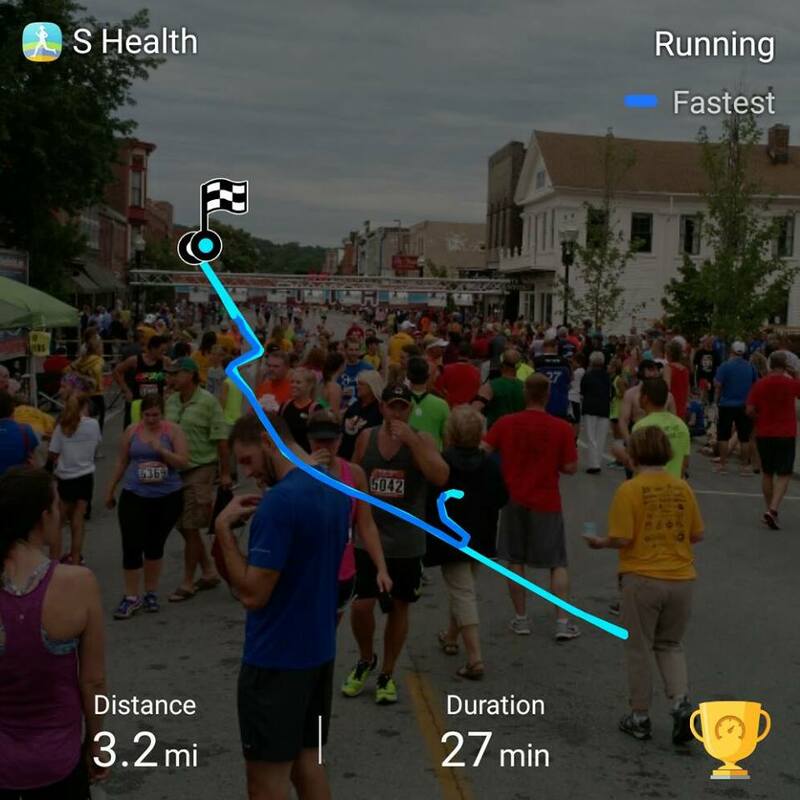 A few weeks ago, I ran my first 5K! My first “official” one, at least (I ran more than 5 km per day for 5 days in a row before actually running this race…). 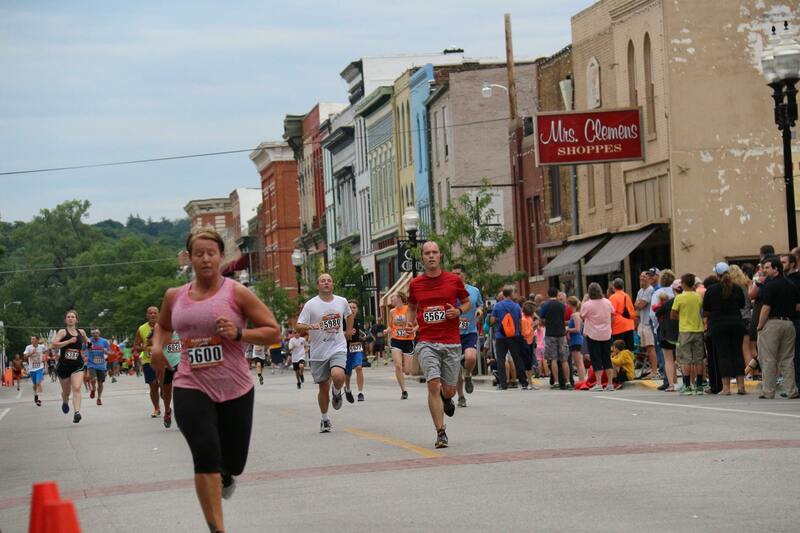 Brooke’s family has run in the Hannibal Cannibal for the past few years, a fundraiser for the local hospital that always takes place on the Saturday morning of Tom Sawyer Days, which is held around July 4th. This particular 5K is notable because of it’s “Lover’s Leap” climb, which is a steep 100 ft elevation that kinda sneaks up on you. I’d never tried this course before (obviously), so though I knew how difficult the HW-79 portion would be (another hill, but a bit slower in grade), yet I wasn’t sure how Lover’s Leap would go. I didn’t quite make it up to the top without stopping, but I made it further than I would have had I not been training. Jogging around our neighborhood here gave me a little practice with hills, but for next year, I’ll have a better idea of what to prep for. Also, a brief aside, but I got a new fitness tracker in late June. The Samsung Gear Fit 2 has a built-in GPS function and barometer that I find particularly useful, as it’s able to keep track changes in elevation, as well as running times. 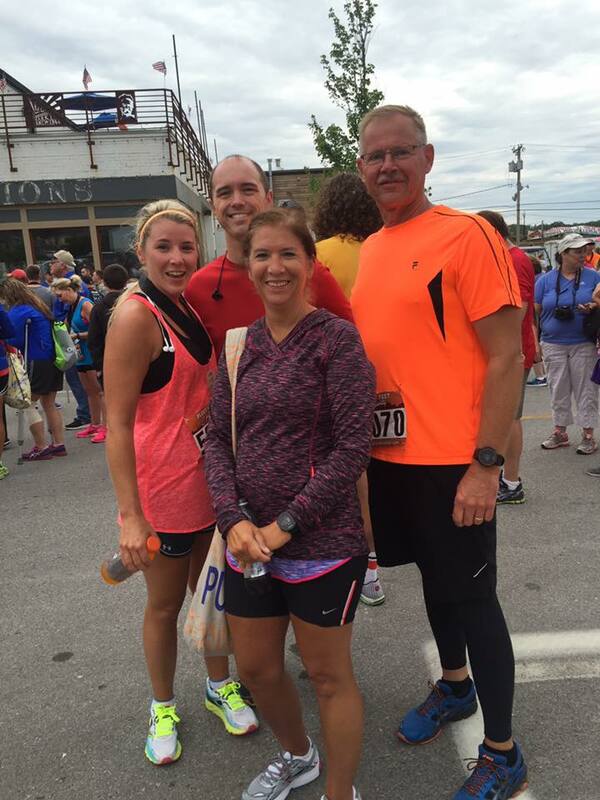 For that race, my official time was 26:51 with an average pace of 8:39/mi. My Gear Fit 2 recorded 8:39/mi as well, though the distance was off because I started it before actually crossing the starting line. For the most part, I’ve been pleased with the performance of the tracker, though its battery life leaves something to be desired. Overall, I placed 7th out of 18 in my age group, so I felt pretty good about that. 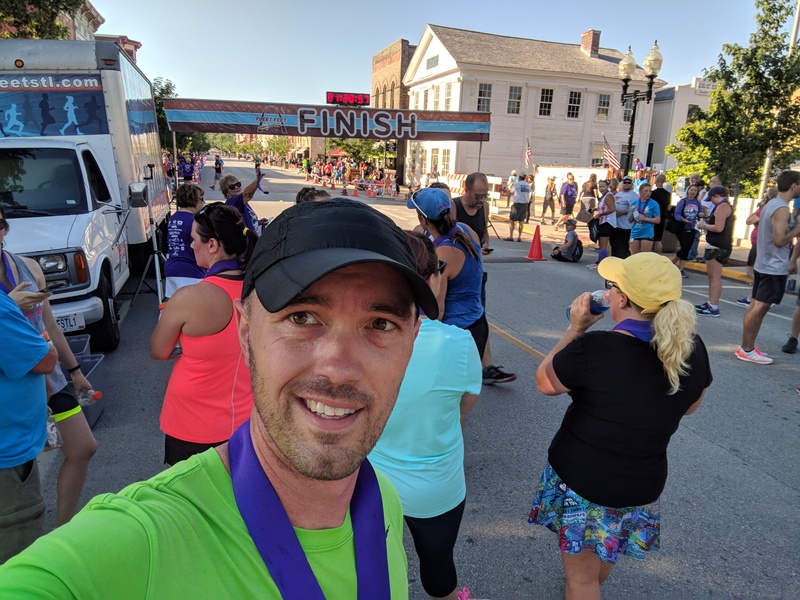 A 27 min 5K is respectable, though I’d have to work quite a bit to beat the 19:48 winning time in my group… To get to the top 3 and win a medal, I need to shoot for 23:27, though, I’ll move up in age bracket next year where they actually ran a bit faster than those numbers this time around (ranging from 20:13 to 22:02 for the top 3). There probably won’t be a medal in my future for awhile, but I suppose that isn’t the point of running a 5K, eh? Lastly, I should note that Brooke’s also planning on doing the 5K in Colorado, though she thinks she may have hurt her ankle and may not be able to actually run for it. The ankle’s on the mend, but while it’s been swollen, she hasn’t been able to go jogging all that much. Perhaps we’ll get her in the Cannibal in time for next year! Again, haven’t posted much recently. I’m still on Break for another two weeks, but much of that has been taken up with various projects around the house (which I still need to take pictures of and post…) and various travels around the state for Christmas. Anyway, Christmas has been pretty fun this year. Meg has been pretty hyper all week, so my patience has been strained recently, but we’re in Hannibal now completing our week-long Christmas celebrations, so that should subside soon. Calvin still doesn’t quite understand the concept of opening presents yet, but he certainly enjoys the new toys he’s been getting. Regardless, this is mostly a “Merry Christmas and a Happy New Year” post. I’m still working on getting everything working properly with the system at home, so once that’s done, I expect to post quite a bit more often. There’s much to catch up on! As Christmas fell in the middle of the week this year, our schedules were thrown into something of a tizzy. Christmas in Columbia with my family was the weekend before, we still traveled to Louisiana, MO to spend Christmas Eve with Brooke’s grandparents, we returned to St. Louis for Christmas morning so the kids could open presents under their own tree, and then we went to Hannibal for yet another Christmas celebration this weekend. That’s all with a second trip to Columbia for Meg and I between St. Louis and Hannibal destinations so I could see a few friends of mine from high school (good times had by all, by the way). Regardless, we had a pretty great trip. We received far too many presents, but that just goes to show how generous our two families are. Meg really enjoyed opening presents four times in a week, so getting to spread these things out over a longer period of time than usual was nice for her. Christmas just kept on coming! Though I knew this phase of my life was coming, it’s starting to become even more evident that Christmas is becoming less and less “for me,” at least with regards to the “magic of Christmas.” I’m not talking about the religious aspect of the holiday, but more the shift from childhood to adulthood, where Christmas was such a big deal for a large portion of my early life. It still is, but now, it’s more of a big deal for my kids than it is for me. I still love Christmas, don’t get me wrong, but it’s beginning to take on a new meaning: where it’s now my job to make Christmas magical for my kids rather than make it enjoyable for myself. I hope that doesn’t sound “bah humbug”-ish, and maybe it’s just something I need to try and work on for next year, but it’s something I’ve been thinking about. Still, watching Meg open her presents (and Calvin in the coming years…he was kinda useless at opening things this year…) was enough “magic” for me. It wasn’t the same, watching someone else open presents as opposed to me opening presents, but that doesn’t mean it can’t be as meaningful. It certainly was this year. Regardless, we had a nice lunch with Ma on Saturday afternoon and then visited with Grandma and Grandpa for a bit. It’s great to see how their faces light up when there’s a newborn in the room to hold! Of course, Meg is happy to entertain everyone with her various antics on these visits, and now that she can talk pretty well (relative to the last time she saw them), she’s quick to ask questions, tell stories, and sing songs. If anything, we’re just happy Calvin and Meg both have great-grandparents to grow up with. In other news, Cal’s sleeping has been “hit or miss.” There are some nights where he’ll spend most of the night in his own crib. There are other nights where he ends up sleeping on my shoulder in the rocking chair upstairs for an hour. And still most nights where Brooke ends up lying in the twin size bed upstairs with him to coax him to sleep. Meg’s “fussy hour” was usually around dinner time, if I remember correctly. Cal’s appears to be a bit later than that, however it still shifts on a whim. When he had his check up last week (he’s gained almost 3.5 lbs since birth! ), the doctor didn’t think it was colic or anything. Probably after he “finds his finger,” he’ll be able to calm himself down a bit easier. Lastly, in the past few days, we’ve noticed that he’s looking around the room more, tracking people’s movements. He likes to watch his big sister, so that’s giving her a few more “entertainment” duties. It’s good to be able to interact with him a bit more now: not just in holding him, but in being able to talk to him and have him listen to you. He’s growing and developing fast! P.S. Sorry it’s been so long since posting. With my abbreviated work schedule and not having two hands available to type in the evenings, blog postings have fallen by the wayside. I’m catching up though. Promise! To be honest, I haven’t been posting all that much recently because I haven’t had much to say. At the same time, it’s been pretty busy, for one reason or another. With Christmas falling in the middle of the week, I feel like my schedule has been thrown radically off course for the past few weeks, and am only just now getting back in the swing of things. Christmas was good, of course. We went to Louisiana, MO for the Baumann (extended) family Christmas on Sunday the 23rd, then continued north to Hannibal for the Baumann (immediate) family Christmas on the 24th. It was odd seeing how much snow was on the ground up there, as we really hadn’t gotten any in St. Louis beforehand. At the very least, it still felt like we got a “White Christmas” out of the deal. After that, we attended our traditional Christmas Eve service back in Louisiana before heading down to St. Louis that night, so that Meg could open her presents under her own tree on Christmas morning. However, since we didn’t get home until 10:00 pm on Christmas Eve, Meg was quite content to stay in bed until 8:00 am the next morning, meaning we had to wake her up to get her to church on Christmas Day (thus, leaving Meg enough time to open one present before leaving). Still, it all worked out. Meg wanted to play with everything she opened immediately, rather than waiting until after everything was opened to choose something to play with. Perhaps it was better to only get one first. We typically don’t go to Christmas Day services, but as we were in town, didn’t have to go anywhere, and our new pastor wanted to have a service on that day (we usually don’t), we went along and had a good time. There were even some folks in pajamas, bringing a good “family atmosphere” to the proceedings. It was a short-ish service, but was nice to participate in. Brooke went to work the next few days, and Meg went to school. I, being the lazy one, stayed home, getting a few things done while watching the Extended Editions of “The Lord of the Rings” (in preparation for “The Hobbit,” which I still haven’t seen!). I assembled Meg’s new “big girl bed” (which she’s now sleeping in, most nights), hung out with a few friends, kept up on laundry, etc. Overall, a good mix of productivity and laziness, so I was satisfied! We then went to Columbia last Friday for the Linsenbardt (immediate) family Christmas. Jake and Kristen couldn’t get there around Christmas, so this is the first year I can remember where we pushed things off a few days. In the end, it was probably better this way as we didn’t feel as rushed, traveling between towns without much lag time. Still, we had a good time and got to hit up Flat Branch and Shakespeare’s while we were there (making it more than worth the trip). Always need more Sesame Street books! Meg stayed in Columbia with my parents while Brooke, Edie and I returned to St. Louis for New Year’s. Brooke actually went in to work for a little bit on New Year’s Eve while I took down the tree and did a few other things around the house. We hung out with Adam and Kelley that night, which was rather nice because we typically have them over to our house (as Meg is usually in bed by 7:30, and they live 20+ min away from our house, making dinner a difficult prospect). Regardless, good food and good times with friends, so it was a nice way to ring in 2013. And now, I’m back at work. I had a good time over break, but am ready to get back to a typical routine, even if it means getting up “early” and putting clothes on instead of staying in PJs all day. 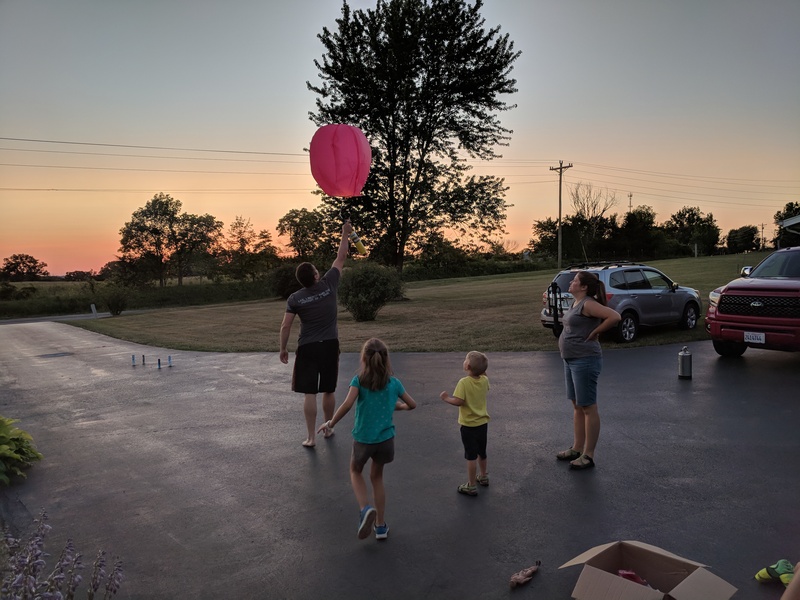 We won’t have any easy weekends coming up, though, as my cousin gets married on Saturday (the bachelor party is tonight, and the rehearsal is tomorrow…I’m an usher and Meg’s flower girl-ing…), so we’ve got our work cut out for us. The final product: fish, hushpuppies, corn fritters, potato salad, tomatoes, baked beans, and a side of chicken for grandma. A new fish place recently opened off of Mark Twain Avenue in Hannibal that my father-in-law, Mark, has started to frequent. The proprietors go fishing on the Mississippi River daily, haul in their catch, clean it all for you, and open for business around 10:00 am. So if you want fresh catfish in that general area, this is apparently the place to go. 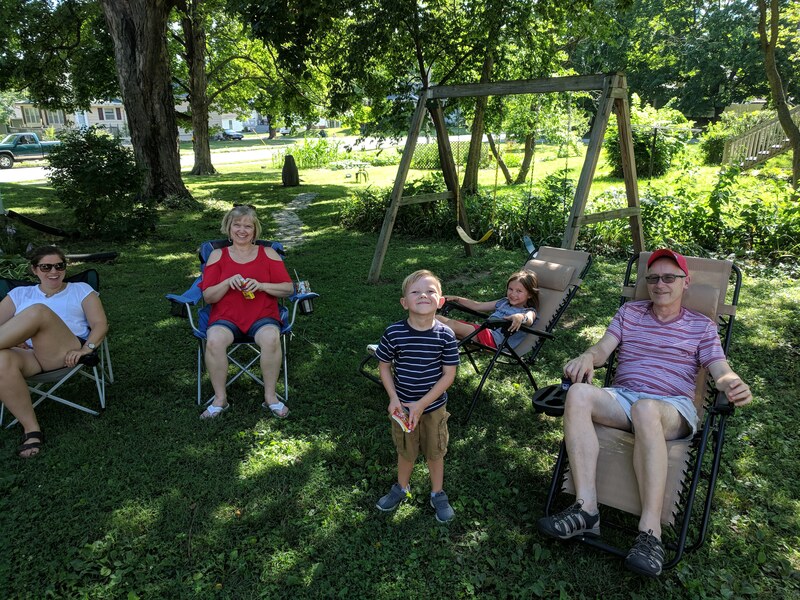 Anyway, Mark decided he wanted to host a fish fry this past weekend, so many of us descended upon Hannibal, MO to have a mix of catfish and buffalo fish, among other things. Mark borrowed the equipment, but basically, we were outside heating up canola oil in a dutch oven over an outdoor propane burner. This one is very similar to the one I just got for my birthday to use in beer brewing. It took a little while to heat the oil up to the desired temperature, but he had an issue with the candy thermometer we were using. As in, it wasn’t working properly, so the first few fish didn’t quite fry correctly. Catfish, buffalo fish, and hushpuppies. The buffalo fish isn’t one I’d ever had before: it’s the “wavy” one in the picture above. The catfish looked like your typical filet, so nothing too special there…except for the flavor, of course. Brooke also made hushpuppies, and those were pretty spectacular. The hushpuppies didn’t go in until after the fish was done, so as to not mix the flavors too much. Brooke tried her hand at some corn fritters. Brooke really wanted to try corn fritters, though. They’re similar to a hushpuppy, but not quite. She made up the corn mix and took it out with a little scooper, dropped it into the fryer, and they turned a nice, golden brown. I think they were a bit softer and less dry than a typical hushpuppy, but in the end, they’re pretty similar entities. Is there a reason to have both? Probably not. But hey, they were both spectacular, so I didn’t complain. They were done once they were floating. You can see the individual kernels of corn on the fritters. In all, the food was excellent. I can’t say I get fresh catfish very often, especially fish that was caught on the same day. I think I preferred the catfish over the buffalo, personally, but they were both really good. I think the corn fritters went over best with people, but the hushpuppies were almost gone by the end, too. Mark, watching intently as artwork was auctioned off. I haven’t attended a ton of auctions in my time. Most of them have been for family members that passed away, so the kids were trying to get rid of all the stuff they had around the house. Old toys. Old magazines. Especially old farm tools and implements, many of which were rusted beyond any usefulness. This past weekend, Brooke’s Dad and I went by an auction hosted by a guy getting rid of some collectibles, among other things. So, in some ways, this was my first auction for things I could actually have some interest in owning. He had an assortment of different items available, ranging from movie posters and artwork, to yard equipment, to two boats and a van, and so on. I don't know what it sold for, but it was in nice shape. We arrived after most of the cooler things had already sold. The Corvette shown above had a photocopy of a magazine listing values for such things, placing the car in the $15,000 to $24,000 range. No clue if it actually sold for anywhere near that. It was a Pace Car in the 70th Indianapolis 500 and looked like it was in pretty good condition. There were a few small children’s cars that had already sold, as well. I didn’t take pictures, as they were being loaded up by the time we got there. They were your “Flintstones“-type vehicle, where your feet would propel you forward as you sat in this metal and wood contraption. Looked cool and was surely antique. This would be nice next to my bar someday. I think Mark was interested in the Betty Boop waitress statue. It was maybe 5 feet tall and looked to be in great shape. We couldn’t tell how much it eventually sold for, but we were told that someone called in a bid of $2000 for it. Not the kind of money I would pay, but still…good to know how much I need to save up if I eventually want something like it. All in all, it was a worthwhile experience. We were only there for maybe 30 min, and that was all we needed to tell that most of the interesting stuff had already sold, and most of what was left wasn’t worth much to us. It’s just interesting to know that what isn’t worth anything to us is worth something to someone else. Needless to say, this year marked quite a few changes for us. The birth of Meg and our move to Iowa have complicated Christmas travels to a greater degree than they used to be. Way back when, we would go to Hannibal/Louisiana for Christmas Eve and then rush back to Columbia/Lohman for Christmas lunch with the Plochberger side of the family. As my grandmother passed away earlier this year, we will no longer be getting together for Christmas Day in the same way that we have in the past, likely doing something like a traditional “Family Reunion” once a year at some other time. Therefore, we won’t have to rush back so quickly Christmas Day. That part is a bit easier. It’s the rest of it where things get interesting. So yeah, it’s gonna get kinda crazy…at least, crazier than it’s been in previous years. It’s a good thing that we have a larger vehicle now so we can carry stuff with us between locations, but it’ll be nice having two cars in Missouri so we can load them both up to get everything back up to Iowa. This brings us to another issue: space. As in, we have very little. Meg, for all of the 17 lbs that she weighs, comes with metric tons of stuff. As in, multiple bags of clothes, blankets, a baby cage (read: “pack ‘n play”), and toys. And we still have Edie to take along, too. And presents for 3 people for the ride home (but presents for 9 people on the way there). 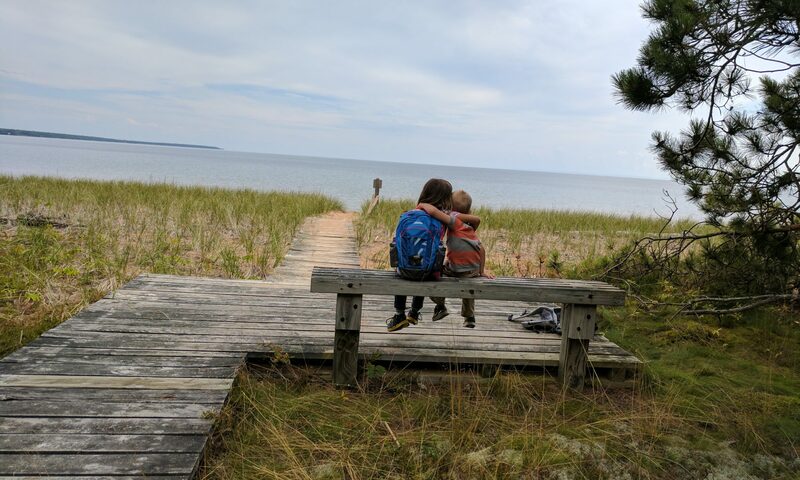 We’re probably going to have to pick up a car-top carrier before we even consider going on vacation next summer. So yeah, that’s this year’s plan. Weather/sickness depending, as usual. We’re just going to make a concerted effort to get through it all mostly unscathed, survive winter, and make it to Meg’s first birthday. Mark your calendars for March 5th! This year marked our annual trek across Missouri for Thanksgiving, but the first time we’d done so with a nearly 9-month-old. We’ve done this every year since being married, but until now, we’ve only had a dog to deal with. This time, we had a baby…plus the carseat and luggage that goes with her. Needless to say, I’m glad we have a different car now, as all the stuff filled up the back to the point where we couldn’t see out of it any longer. Regardless, we went to Hannibal for the Thanksgiving holiday where the majority of the Poor/Baumann clan typically goes. Meg did great, for the most part, but didn’t sleep terribly well the second night. As usual, the food was great, the company was fun, and the “Poor Women” entertained me with their video game shenanigans (this year, some fun with “Just Dance 2“…and yes, we have video evidence…). On Friday, we continued our Tour of Missouri by driving to my parent’s house in Columbia where we hung out with the immediate family. Again, Meg did pretty well the first night…and not so well the second night… But overall, again, good food had by all, and a rousing game of Trivial Pursuit on Saturday night. And, on another side-note, I was looking to see if the Dave Matthews Band performance from the 2010 Grammy Awards was posted anywhere and, low and behold, it’s up on Youtube. I tried finding it the day after the awards and the only place I could find it was iTunes for $3. Outrageous! Therefore, I post it now. It’s, perhaps, the best live performance of them I have seen and, by far, the best performance of any group at the Grammy’s that night. They should have won.